Somewhat as a followup to my previous post Niwaki: Bonsai in the Garden, about training unpotted garden trees in a bonsai fashion, today I bought a weeping larch. Long time readers of this blog will I know that for years and years I have wanted a Weeping Blue Atlas Cedar, Paul James had one on his property and it showed up often in his TV show and I wanted it bad. Unfortunately, they aren’t quite hardy here. I eventually got a different cedar, an upright version, that was hardy, but I was still missing that architectural interest of the weeper. Then I discovered larches. They are hardy here, hardy to zone 4, not the zone 6 of the atlas cedar. They have very similar needles (short, soft), and while they are a deciduous conifer, I don’t mind that. So, today I bought one. Often you will see these grown in an overgrown, mop head, or dreadlock-y fashion, where the plant looks like some swamp thing reaching out of the ground with tendril-like branches draping it from head to toe. I didn’t want this. I wanted to show off the interesting growth habit, and an interesting trunk. So I bought a tree that emphasized the trunk, and then I did some additional pruning to expose more of the trunk to view. Untrained, these trees will grow along the ground, so you have to train them to grow upright, and if you have to train them anyways, you might as well train them to grow in an interesting way, like you would with a bonsai. So this tree is very very similar in shape and form to a nice bonsai you might buy, only it is 6 or 7 feet tall. Check out that contorted trunk. Of course, to get a bonsai this big or old you’d pay a fortune, tens of thousands of dollars. Whereas this tree was only $200ish, I call that a bargain. Check out that cortorted trunk. Good for me the needles even are slightly blue, though not as blue as the atlas cedar. Still, compared to the bald cypress needles (which is growing behind it) it looks quite blue. 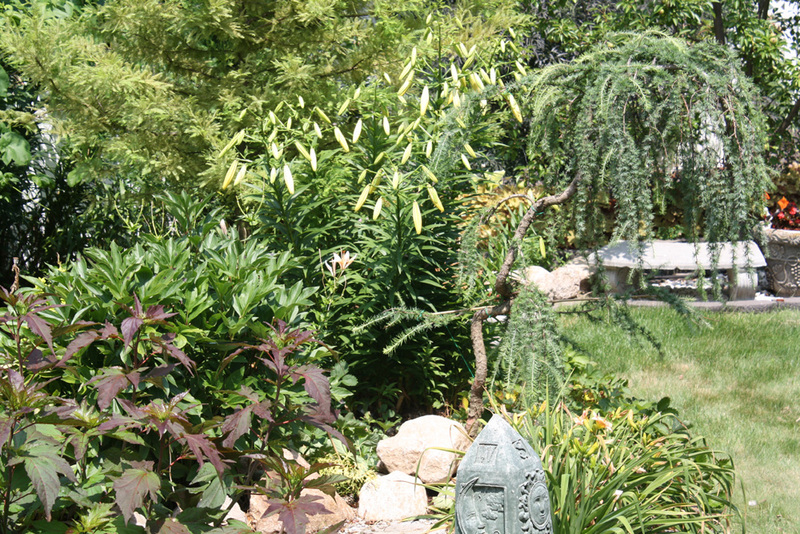 The cypress will grow formal and upright, so this will be a nice contrast, and good garden design is all about contrast. I’m really excited about this new tree. Looks lovely! We’d love to see how much it grows months later. It sounds like a great bargain! I live in Duluth, MN (zone 4). 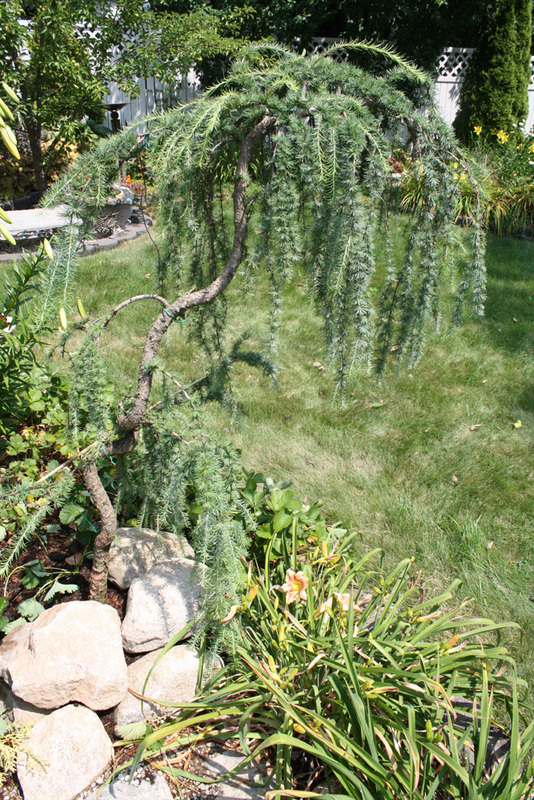 I went on a garden tour here last weekend, and one of the homes had a beautiful Weeping Larch tree. I hadn’t seen one here before, and I went home with that being on the top of my “Must Have” list. The trunk on their tree had been trained and was pretty much upright. I like the photo you posted with the twisted trunk. Can’t wait to find the perfect spot to put one in my yard. Nice post. Thanks. I’d also like to say that this is a wonderful post, and thanks for sharing! Question….how does one get the trunk to twist and turn like the one you have. You need to train it as it grows using wires, stakes, trellises, etc. I of course didn’t do this, since I bought it at this stage, but that is how it was originally done at the nursery. Cool tree. I will have to keep this in mind, as I am seriously dying for a blue atlas cedar myself, but they are marginal here (zone 5/6 border in NY). We just lost 2 large pear trees to a freak October snow storm – 16 inches of heavy, wet snow on trees that still had all their leaves = not good. Would loooove an upright blue atlas to replace one of the pears….. But to avoid the sadness of losing another tree, I might have to choose something else. Hardy to zone 5. Mine is doing great. I live in Tulsa Oklahoma, and really would like to plant one of these, however I am new to planting anything shy of my first garden this year if you could help by letting me know if it’s within this trees requirements any help would be appreciated.